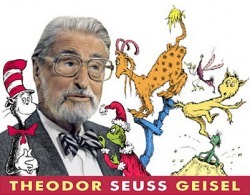 Did you know that Dr. Seuss has writtern books that have been challenged or have controversial titles? Many books have been challenged or banned throughout the nation. Reasons for banning books include: profanity, violence, attacking social groups, and many other reasons. Banned Books Week is a week dedicated to banned books and challenged books. My partner and I have chosen to be against banning Dr. Seuss books. Our opinion is that people take things the wrong way or overreact toward Dr. Seuss books and what they may portray. The Lorax, a challenged book by Dr. Seuss, is an innocent children's book that is not meant to turn people against the foresting industry. Dr. Seuss was just trying to say that overforesting is not good for the environment. There are many examples of censored books. The Lorax is one of Dr. Seuss' challenged books but there are other Dr. Seuss books with controversial titles.